It’s been happening since Min was eight. Every two years, on her birthday, a strange man finds her and murders her in cold blood. But hours later, she wakes up in a clearing just outside her tiny Idaho hometown—alone, unhurt, and with all evidence of the horrifying crime erased.Across the valley, Noah just wants to be like everyone else. But he’s not. Nightmares of murder and death plague him, though he does his best to hide the signs. But when the world around him begins to spiral toward panic and destruction, Noah discovers that people have been lying to him his whole life. Everything changes in an eye blink.For the planet has a bigger problem. The Anvil, an enormous asteroid threatening all life on Earth, leaves little room for two troubled teens. Yet on her sixteenth birthday, as she cowers in her bedroom, hoping not to die for the fifth time, Min has had enough. She vows to discover what is happening in Fire Lake and uncovers a lifetime of lies: a vast conspiracy involving the sixty-four students of her sophomore class, one that may be even more sinister than the murders. Well damn. This book blew me away. It was so incredibly good, and even now I can't stop thinking about it. Before we even get started, let me tell you, this book doesn't just take you for a fun ride. It takes you on a freaking rollercoaster. Let's start with the premise and story. There's been a lot of buzz about this novel and trust me when I say it's for good reason. This book draws you in before you even begin reading. Just the blurb had me hooked, and the story itself completely lived up to my expectations, satisfying me and giving me everything I wanted. The novel is a mystery thriller and follows Min, who keeps getting murdered - over and over again. I don't want to give away too much because it really is one of those novels where the less you know = the better, but it follows Min and Noah trying to figure out why this happens to her and getting to the bottom of Project Nemesis. I'll say no more - go and read it to find out what happens. As a thriller, this book really is thrilling. The story is very cleverly crafted, secrets, mystery and questions all woven together expertly. It really creates the perfect combination to keep you both hooked and on the edge of your seat, or in my case the edge of my bed. I rarely find a book that wills me to forgo my sleep to finish it, yet Nemesis did just that. Reichs has spun a story that kept me utterly thrilled and turning pages, through the night, unable to set this book down. That's when you know a story is well done. The writing also made this story perfect. A massive part of thrillers is showing and not telling, but also knowing how much (or little) to show. Reich's nailed this. The writing was exectued so masterfully. The prose created solid and rich descriptions that really pulled me into the world and made me feel like a part of the story. This, for me, is a must in experiencing a novel and staying hooked, and Reich's managed to capture me entirely. I also felt the balance of dialogue with description was on point. The right balance meant I never felt bored and the book never became too slow, the writing allowing for a really good pace. For Nemesis this translated into a fast pace, but that's exactly what I needed and wanted, with this being a thriller. Having plenty of questions and secrets being thrown at you, the book needs to be able to keep up with your desire for answers, and Nemsis does that very well. I think something that really worked for me in this novel is that the thrill factor was held as paramount. 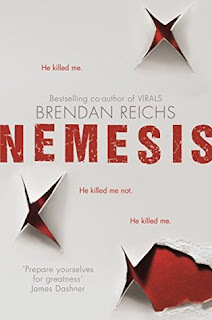 Yes, there were emotional scenes and yes there was a touch of romance, but Reichs made the correct decsion to keep this mininmal and focus on the mystery aspect, which I felt really propelled the story forwards and kept me engaged. The romance was kept minor and the suspense kept a max, making the focus and purpose of the story clear and effective. The book was able to thrill fully, and thrill it defitniely did. Charcaters I kind of have mixed feeling on, but ultimately I think it works. Noah was where it kind of started to go a little astray for me. It's kind of weird in the sense that I can see a lot of similarities between both Noah and Min's personalities and voices, yet at the same time I can also define key differences, and I found myself prefering Min. For me I found Noah just a little too angsty - a little too willing to contribute an endless string of complaining, sometimes coming out with stuff that doesn't really add much to the story. However, Min managed to save this, in her logic and practicality. She's the character you're looking for a in a thriller; practical and quick thinking, she helps to move the story along quickly, and efficiently raise the questions needed to develop the mystery and genereate the thrill. I also felt I was able to really connect with Min, which helped to me have a genuine interest in following her and trying to figure out what was going on with her deaths and project Nemesis. All of the characters were well buillt and given enough depth for me to care about them, but Min, being the main character, had the most to her and I really did feel invested in her journey. The atmosphere, overall, really worked for me also, having the right amount of edge and darkness, whilst still maintaing itself as something that is not 'adult'. Writing a thriller is something that requires all aspects to be on point; investable characters, a quick story, expert writing, showing not telling etc. Reichs absoultely nails it, prodcuing an enaging and fast paced rollercaster that will have you on the edge of your seat. The layers of the story peel away one by one and will keep yout turning the pages well into the night. As for the ending, it struck just the right balance. It satisifed me in asnwering what I wanted to know - I didn't feel like I had wasted anything in reading the book. I'd got what I wanted from the ending, but also more. It's set up perfectly for the next installment and has left just enough of a cliffhanger to make me hungry to read it. Overall Reichs has created an asbsolute rollercoaster of a novel that is both suspenseful and riveting. In all seriousness, you won't be able to put this down. Already, this is one of my favoruite novels of the year and I encourage to pick this up and give it a go. I promse you won't regret it.